Aviva Systems Biology provides our customers with an extensive collection of quality antibodies for research and diagnostic applications. Aviva currently offers more than 60,000 primary antibodies and, due to their high throughput antibody production releases more than 200 new antibodies every month. Aviva´s focus is antibodies to key targets in areas of transcription, epigenetics and cell signaling. 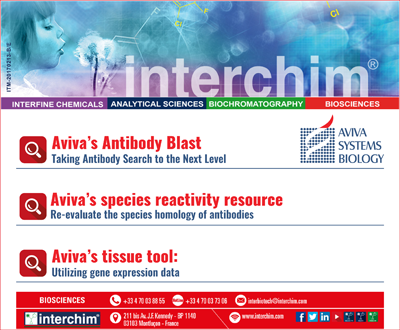 Aviva´s antibody collection includes unique antibody content to many targets that are not commercially available elsewhere. We place our emphasis on family-oriented antibody production has yielded antibodies to most members of key protein families such as Transcription Factors, Transcription Regulators, RNA Binding Proteins, Ion Channels, and Cell Membrane target proteins. Antibody BLAST : Aviva’s new Antibody Blast takes the concept of BLAST to a new level by finding antibodies that are homologous to a DNA, RNA, or protein sequence. Species Reactivity Ressource : Aviva uses computational homology to display other relevant species associated with the antigen sequence. By doing so, they have now been able to re-evaluate the species homology of over 50 000 Antibodies. Aviva Tissue Tool : This tool uses nucleic acid-based microarray data to predict and confirm the location of protein expression.